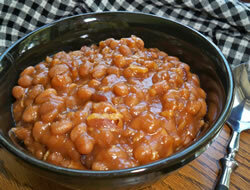 Sweet baked beans with bacon for added flavor. 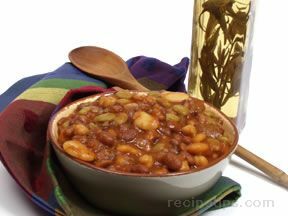 Baked in the oven or cooked in the slow cooker, these baked beans are perfect for a pot luck or a backyard barbecue. Mix all the ingredients together and pour into a casserole or slow cooker. Bake at 325 degrees F., covered, for 2-1/2 hours. Stir every hour. 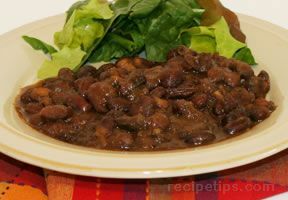 Or, pour into a slow cooker and cook on low for 5 to 6 hours. "If you add a LB. 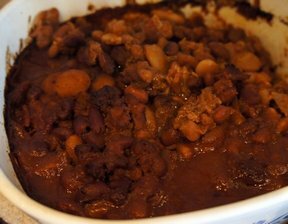 of ground beef browned and drained, and a diced green pepper, it is even more amazing"
"I loved these baked beans. They had a touch of sweetness and a savory taste from the bacon. I had to spoon a little juice off because they were a little runnier than I like but I would still make these again. They were simple to make and great tasting!"